Netflix accounts for 15% of global net traffic according to new research. The study, from Sandvine (a bandwidth management company), found that video accounts for more than half of net traffic, while gaming and file-sharing are on the rise. Read more about the study over at BBC News. The term strategic is thrown around a lot, but has anyone ever sat you down and told you what it truly means to be strategic? If the answer’s no then this Medium article from Facebook Product Design VP, Julie Zhuo, is for you. 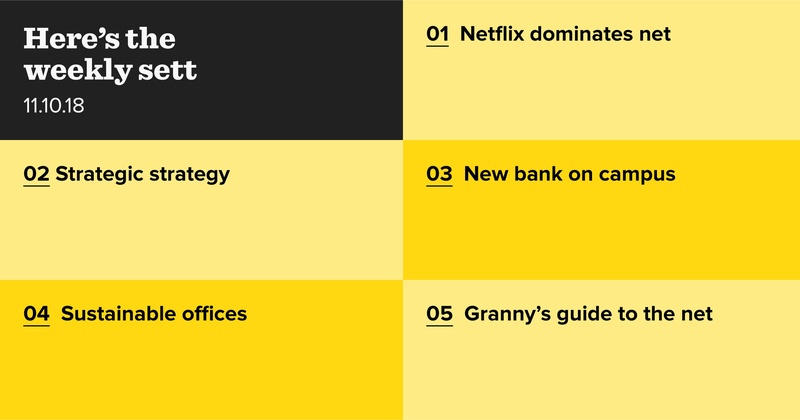 It outlines just what you need to know, taking the definition and breaking it down, and then providing some tips on how to actually be strategic. In case you missed the multiple headlines this week, German online-only bank N26 is launching in the UK. The bank will be the newest in the market of branchless banks cropping up, and already has a 50,000 long waiting list. Learn more about the “bank account for every day” over at the Evening Standard. Another Medium article but this time from ClimateAction.tech. With the environment heading for a hot future (as in temperature, not Paris Hilton positivity), it’s important that offices learn to be more sustainable. In this primer, you can learn the steps to take towards sustainability and how many other tech companies are doing the same. The Goods by Vox (the American website formerly known as Racked) has published a review of the user experience of the top online retail sites, created by 64-year-old Pam Allen of The User is My Mom fame. Guiding us through the top retail sites, Pam highlights E-commerce pain points that the average online shopper would encounter, such as scrolling and auto play.